I thought I would write you a letter and post it on my blog as I never talk about books on my blog, so I figured no-one would mind. First off, I want to say thank you for being the best friend I ever had. You've never let me down, you never left me, and you never held it against me if I didn't want to be your friend for a few months. But really, when I was an awkward kid and couldn't figure out why people didn't like me, why they were mean or why I didn't like the same things.. you never judged me. You held out your arms and welcomed me every time. You made me feel normal. You stayed with me during the annoying teenage years when I thought I was too good for you. You said 'You'll be back Kristen. This isn't you' and I scoffed. What did you know? My 'friends' didn't like you, neither did I. But you were right. You snuck back in by introducing me to Lord of the Rings, Harry Potter and my one true love, Pride & Prejudice. It was then that I realised you knew me, you had my back, and you'd never let me down. I forgive you for showing me Twilight. Just kidding, I love all of you just the way you are.. Exactly how you love me. Our relationship is the longest I've ever had. But on top of our awesome history, I am thankful you are in my life for a multitude of reasons. Shall I share them with you? Since I drive to work, I can't read whilst operating a vehicle. I used to, but then I had an accident, so thank goodness for audiobooks! They allow me to keep you around at all times. They allow me to combine things I love, like running and reading, and things I don't necessarily love, like cleaning and reading. So, thanks for that. You've never judged me, even when I have to google a word within your pages. Especially when I say 'screw it' and I don't google, you don't judge me for just assuming what the word means based on the words around it. Heck, you helped me understand Americans, because I do that exact thing when I don't understand something they say. I feel like you make me smarter. Is that true? I don't think so, but I feel it, and that's what matters (another lesson learned from you, you multi tasking teacher, you). Sometimes I need to put the world on a time out, I need to pretend I'm a different person in a different life. Does that mean I don't like my life? Absolutely not - and you understand, and you let me be whoever I want with zero judgement. You taught me how to feel. I have lost, loved, felt tricked, grown with, hated, laughed with, befriended more fictional characters than people in real life, and I cherish every adventure and every emotion from every relationship. I have never felt alone with you by my side, even when I was. You taught me that no-one knows everything. Even me. You taught me that it's okay to be different, to think differently, to want something different. You taught me to think for myself. You taught me how to empathise with people, even crazy people. I am able to translate that to real life, and realise that I don't know everyone's story and shouldn't judge so quickly. A book can change everything. You have changed the way I view a situation I thought I had a firm opinion of, you have opened my eyes to things I would never have considered on my own, you have changed the way I live and the choices I make. You make me look around and be thankful for what I have, you make me more aware of the world, you make me realise the little moments are just as important as the big ones. Most importantly, with every book I read, you teach me something new. You have showed me things I would never have seen without you. You teach me more about myself than I ever would have learned without you. Actually, I think most importantly would be that I can wear sweatpants or no pants when I'm with you, and still be doing something productive. So, thank you for that. Please don't ever leave me. Ps. Training for Tuesday is next week - the 31st. You should link up with the girls, share how your resolutions are going, or any goals you have, races you ran, if you're training for anything, changes you've made - whatever! I'd love to read them! I'll finally be talking about the RnR half, my 5th half that was by far the worst race I've ever run, but I'm not letting it get me down! This is exactly how I feel about books too! I would add that they are my favorite travel partner, because not only do they take me around the world without having to leave my house, but we can travel to different time periods too. They are the real-life time machines! Loved this post! I wrote a letter to pizza once. Yours was way better -- and I love this because it's all so true. I think this is my favorite post you've ever written. It's perfect. This is such an excellent post. It made me want to laugh and cry and then go grab a book! I have no shame in saying that I enjoyed the Twilight series. I actually watched the first movie before I even knew it was based on a book. The movie we wanted to go to was sold out, so we decided to go to Twilight even though we'd never heard of it and then I got hooked on the books. I was sort of in a reading slump and they got me back in the game. You are adorable. :) I've totally said "screw it" and assumed what a word meant while reading, haha. Mainly back in school while reading a classic novel or something.... oops! I love when books make me feel, too. And take me to a different place. Happy sigh. :) hahaha no judgment from books while we wear sweats and look like bums. This letter is PERFECT. happy Friday!! You're hilarious! I tell you what, books definitely make you smarter. I watched a half hour of the Kardashians last night and I'm dumb as rocks now. Never. Again. You are too cute! I love to get lost in a good book!!!! You are so funny! I love to read as well and thankfully so does T. I cant imagine having a child that despised it (like some do). It would break my heart. haha I love this and love reading. Always down to dig into a new book. I love this letter! I love books! I love books!!!!!! 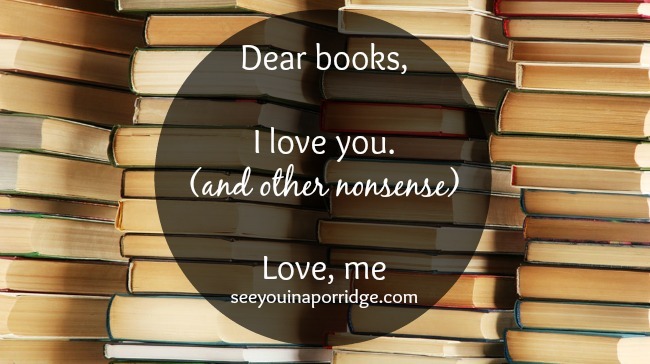 I am so glad you found your way back to books because they are the best! Always there waiting for you to come back and read them. Great post girlie! This is so perfect and so true. I love books for all the same reasons. Books and my lifelong love of reading them made me a writer, and reading makes me a better writer still, today. Books absolutely make you smarter. They make you think critically, they introduce new language and concepts and world views. They, like you said, give you the ability to empathize with things or people you maybe wouldn't otherwise. And literature doesn't happen in a vacuum, so when you read a book, you're not just reading a story about the characters. When you read Shakespeare, you're learning about life and the world in Elizabethan England. When you read Fitzgerald, you're learning about life and America in Post-WWI chaos. It's a really beautiful thing, and for me, it was one of the best things about being an English major in college. I read books and I learned about the whole world—ancient Greece, mid-century Italy, the greatest women writers who ever lived, poets of the past few centuries... Books are a gift and a friend. I love this so much. I love this! This is how I feel about books too, I just love the escape. And that you are relaxing and enjoying yourself in your sweats while still accomplishing something. Books keep your mind going! My mom said that books are never a waste of money and she always let us pick books out every time we went to a bookstore and never batter an eye! Have a great weekend! I have a post in draft that I plan to complete this week about my childhood books. 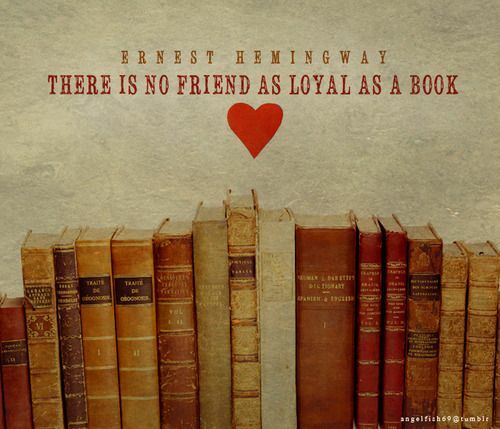 Books really have been a long relationship - the longest as you say. I felt the words because this is so me. I used to be considered odd for reading so much as a teen. An enigma really because I hung with the "cool kids" but every spare moment I had, there was a book in my hand. All that babble to say I loved this post like a fat kid loves cake. PS I really need to try audiobooks for those weeks when i don't have as much time to read as I would like. Also ... they come in handy at the gym since Ive run out of good podcasts! haha again making me laugh. i love a good book but i hate it when a good book is made into a movie that is awful! Books/reading really is the best - I can't imagine a life without books!! A letter to books is the best idea ever. You win at life, Kristen. I might steal this one day. Alright. I'm about to get serious. I've enjoyed almost every single one of your posts. I like you. I like your writing. I enjoy the thoughts you share. We have some similar interests and experiences...and some not at all, and I like to read our differences. But, this is my favourite (Aussie spelling for you) post I've ever read of yours. Just perfect!!! I love audiobooks! I go through them like no one else. I once went through 4 in one week, I didn't do anything else with my life that week but I was content.